Only Wondermum’s PROFESSIONAL hire pools come with an Non-Toxic, original and fitted liner. Our liners are Eco-friendly and FREE OF BPA, Lead, cadmium & heavy metals, latex free and they also meet the EU standards concerning phthalates. They will not bunch and cause discomfort & irritation during your labour. Most of all they are a SAFE choice for you and your baby. This is the Professional MINI Birth Pool in a Box Pool, comparable to La Bassine in Size. It is still as deep as the other pools, but better suited to one person. If you want your partner to be able to join you in the pool then you should look at the Professional Birth Pool in a Box REGULAR PRO pool. A birth pool can be used if you are birthing at home or in the hospital/birth centre. You can use it during labour at home to deeply relax and encourage contractions, whilst providing effective natural pain relief. Water can be very useful during a stalled labour if this is due to stress or anxiety. Sometimes the change from water to walking can also be useful in moving things along. 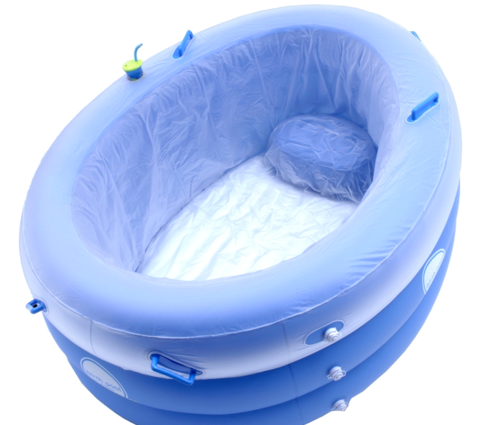 We offer birth pool hire of the Luxurious Eco-friendly Birth Pool in a Box Pool MINI with cup holder for your home birth or water birth of your baby. This birthing pool is provided clean and sterilised. Our pools and liners are made from a special vinyl that is eco-friendly and free of latex, BPA, Lead, Cadmium & other heavy metals. The Birth Pool in a Box is super sturdy so you can have a support person sit on the side, it provides a seat and plenty of room to change positions freely and it is extra deep for a wonderful feeling of buoyancy that supports and eases your labour. There are conveniently placed handles on top and on the sides, which gives you extra grip area for changing position or holding onto during second stage. The floor is fully inflatable, so you don’t have to worry about bruising whilst on your knees for long periods. Click here to read the full specifications of the Birth Pool in a Box Pool MINI. Expectant mothers tend to book months in advance, make sure you Enquire or Reserve a booking NOW to avoid disappointment! Courier to you & return is included in your hire Or you can pick up in Waiuku, South Auckland. You can read our birth pool hire terms & conditions here. By hiring our Birth Pool you agree to these terms & conditions. Please indicate your Due Date &/ Preferred Hire dates in the “Order Notes” on the right side of ‘Check Out’ Page. By default hire period is a maximum of 4 weeks (not including courier times) from 2 weeks prior and 2 weeks after your due date, with no minimum period. We send pools earlier where possible and can extend your times if needed, please let us know.